The debut album will get a laid-back re-release. 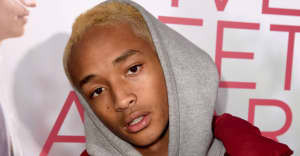 Jaden Smith announced via Twitter that he'll release an acapella version of his debut studio album Syre next year, in conjunction with the album's follow-up, Erys. No word on whether the 17-track album's collaborators, like A$AP Rocky and Raury, will make the rerelease, but so far the vocals sound very haunting, which is always nice. Last night, Jaden joined Brockhampton on stage in a surprise guest performance. Earlier this week, he went on a sleigh ride with his dad.